Join the discussion on our forums! Come discuss Vicious Scalehide over in our dedicated Vicious Scalehide discussion topic. They make wonderful pets if you're not allergic to blood loss. 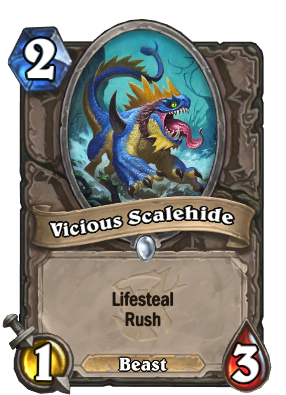 Best zombeast combination, Vicious Scalehide and Bittertide Hydra. It's crazy in standard quest rouge too. Secretly the best Hunter card in the Witchwood. Hitting this with a Dire Frenzy or mashing it up into a Zombeast gives the class some much-needed survivability, allowing Control Hunter to finally function well. It's about damn time. Could be good in hunter if you can hit it with Crackling Razormaw, Houndmaster or Dire Frenzy. It is a good card. I see this being fairly good in Paladin too, with Call to Arms and pulling / dropping a wolf next to it. also has synergies with Corpsetaker, The Glass Knight, and buff. Insane when picked with Deathstalker Rexxar hero power. As strong as this card can be in many decks, why bother running it when you have better creatures/spells to pick from? 1 attack is pretty bad for a two drop, even if it lets you attack with it immediately. Most play this card is going to see in my opinion is from Build-a-Beast, in which this card is absurdly good at recovering with. Sweet, Hunter has some Healing. Now we just need some card draw. Decent ping alternative for non-ping classes. Well actually +9 health, because hydra will deal 3 damage to you and lifesteal will trigger and heal it back up. This card is pretty insane as zombeast, for two mana it has good stats, you just put some stats to it and you can have beast with charge and good healing + some other benefits like poisonous or some deathrattle. Now we just need blizzard to fix dk rexxar so we can have this as an option as well. one attack lifesteal. it's a joke? It's a shame that it has a beast not a dragon tag. Still nice 2 drop. Lifesteal makes it quite good for paladins too. Paladins have better heal options. Its a cheap beast. Its mostly insane for hunter. Rush will actually give the class a chance against aggro pally. Zoo beast hunter could very much see play.